Solar Analytics was recently accepted into the Plug and Play Tech Center (PnP) - the world's largest tech accelerator - in Sunnyvale, California, and our Product Manager/Professional Frisbee Coach Yew Eng Ng is currently meeting with mentors, VCs and angel investors from the company's huge network of corporate partners. Solar Analytics will be in full force at the Smart Energy Council's Smart Expo 2018 this week; catch up with the latest on peer-to-peer energy trading, energy data for smart decision making, monitoring energy use and storage performance, and the huge uptick in consumer demand for solar, by one of our team at the conference tracks. Or simply introduce yourself to one of us on the show floor, wearing our purple I Love Solar tshirts. We'd love to meet you. For some Australian states, Daylight savings finished up over the weekend, meaning in our house we had to both turn all our clocks back an hour, as well as adjust our load energy usage patterns. April is a great time to re-visit your solar profile and make adjustments to ensure you're using your appliances at the right time. 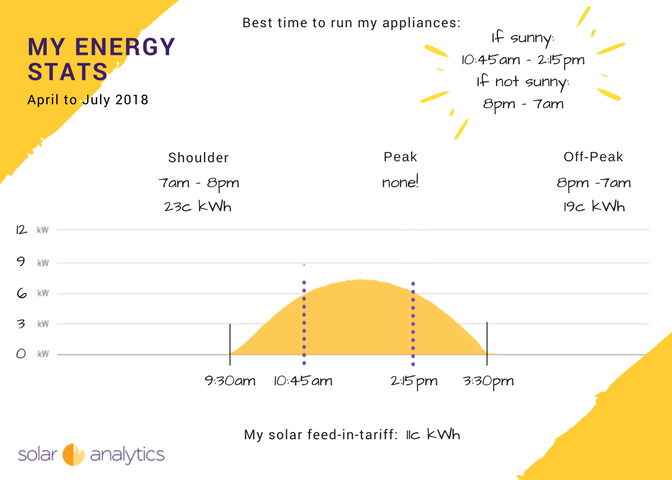 Download our handy Energy Stats cheat sheet printable to fill-in and stick up in your laundry (or wherever your major appliances are).